Current tally of the nature of Kepler Objects of Interest (KOIs), as told by the results from the code vespa. Notice that almost half of them are false positives. FPP = false positive probability. You probably already read or heard about it: the Kepler mission recently announced the discovery of 1284 new exoplanets, more than doubling its number of confirmed planets outside the Solar System. This is no small feat, and in fact, Kepler’s productivity poses a serious problem: because it discovers so many candidates, it’s difficult to perform follow-up observations on all targets to confirm the nature of the transits. This is where we pull ourselves up by the bootstraps and probabilistic validation comes into play. Kepler looks for exoplanets using the transit method, which relies on these pesky objects to cross the line of sight between the Earth and the host star, causing a dip in its brightness. The problem is that not every dip is caused by a planet, so these signals have to be considered only candidates. 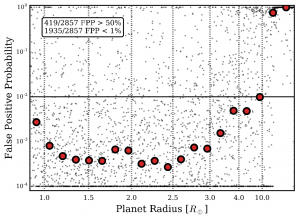 Normally, when someone discovers a transit candidate, other astronomers have to do radial velocities follow-up observations aiming to confirm or bust the existence of the exoplanet. But these observations are very time expensive, and generally require large telescopes because Kepler usually observes only dim stars. To circumvent this problem, the main approach has been to demonstrate that all other conceivable scenarios are much more unlikely than the planet transit explanation, i.e., probabilistic validation. In the past, astronomers used to confirm Kepler transits with cumbersome, computing-heavy probabilistic methods, which were not optimized for large batch processing of many candidates. In order to address this limitation, the astronomer Dr. Timothy Morton, first author of today’s paper, wrote the open source Python module vespa (wasp in Italian and Portuguese). The way vespa works is by assigning false positive probabilities (FPP) to different hypotheses that explain the transit-like signal using fully automated steps. The higher the FPP, the less likely the signal is to be regarded as a transit. vespa‘s trick is that it creates realistic populations of astrophysical false positives and compares them to the transit signal, allowing for the inference of the FPPs in an objective fashion. 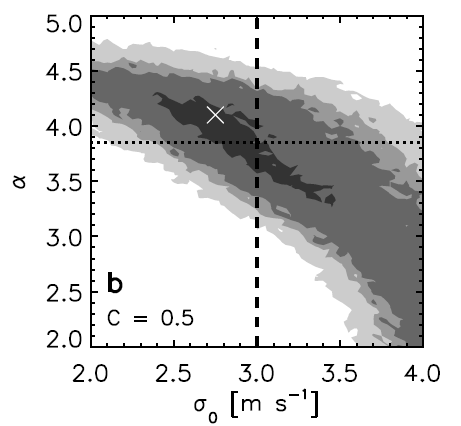 These populations consist of various “simulations” of transits with different educated guesses for the parameters of the signal’s shape and for the physical parameters of the host star. The authors of today’s paper applied vespa to all 7470 Kepler Objects of Interest (KOIs) from quarters 1 to 17 in the NExScI database, and successfully calculated FPPs for 7056 of them, of which 2857 have reliable FPPs. In the end, the authors decide, with proper precedent, that the threshold of planet validation is a false positive probability of less than 1%. They find that 1935 KOIs have FPPs below this threshold, which means they are validated at the 99% level. Of these, 1284 are new validations, while the remaining ones were already confirmed (see Fig. 1 below). Moreover, 9 of the new validations are planets that may be in the optimistic habitable zones of their host stars (see Fig. 2 to check the radii and orbital periods of these planets). The authors also identify 428 KOIs that were previously marked as candidates, but are likely false positives, according to vespa’s calculations. Figure 1. The false positive probabilities (FPP) of all candidate or confirmed KOIs with reliable vespa results in function of their planet radius. All of those below 10^(-2) were confirmed by vespa, while those above are likely false positives. The red circles are median values of FPP in equal-sized bins. Figure 2 (adapted from original). 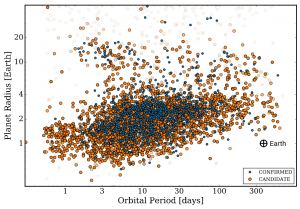 Most of the exoplanets we detected with Kepler are in configurations that we do not see in our own Solar System. For reference, see the approximate position of the Earth in this plot. The main limitation of this method is that it is difficult to to “validate the validations”, because of the large amount of effort required to do follow-up observations. But the ones that were performed by Spitzer (50 KOIs) and radial velocities monitoring (129 KOIs) do support vespa’s results. The authors also point out that more detailed studies of small subsamples of KOIs would help us understand better the false positive probabilities of these candidates. One of the purposes of today’s paper is exactly to kickstart the astronomical community on more detailed studies of subsamples. And, as always, we are looking into the future: the missions TESS and PLATO will definitely produce many transit candidates, so vespa is a huge step towards more effective data analyses.